What is this funky device called? Cracked by Dibyo , gudanggurum , Tathagata Chatterjee , Goyal , Ranjana Ninan , Rohan , Chandrakant Nair , Prasad , malcaluffin , akhi , varuns88 , Priya , rajeshvj and udupendra. 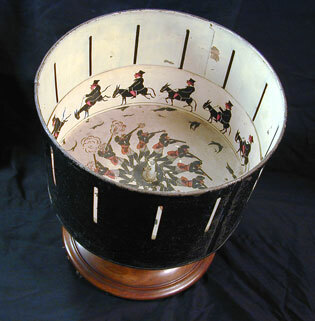 Its actually a Zoetrope not a Phenakistoscope. Zoetrope – Gives you an illusion of moving pictures when viewed from the slits. Is it a Carausel Motion Lamp. When lighted, it revolves and the paintings inside appear as if moving. The Zoetrope , which was used to view d equivalent of a motion picture in gud ol’ times…Was initially named “The daedalum” meaning ‘the wheel of the devil’ in Latin..
Zoetrope. A question I’ve asked in a couple of quizzes is to put this alongside a photo of Francis Ford Coppola, and ask junta to connect.